Today Prince Harry and his betrothed, Meghan Markle, made another round of public appearances. This is a big part of the job of being a royal, such as it is—showing up, shaking hands, and looking deeply interested in whatever your hosts choose to present to you. In this instance, it was a large wedding cake that was in fact made of cheese. According to People, this culinary feat is “made of layers of Black Bomber, an extra mature cheddar; Red Storm, a vintage Red Leicester; Beechwood, a smoked cheddar; and Green Thunder, a cheddar with garlic and herbs” by the Snowdonia Cheese Company. “We made it for them. 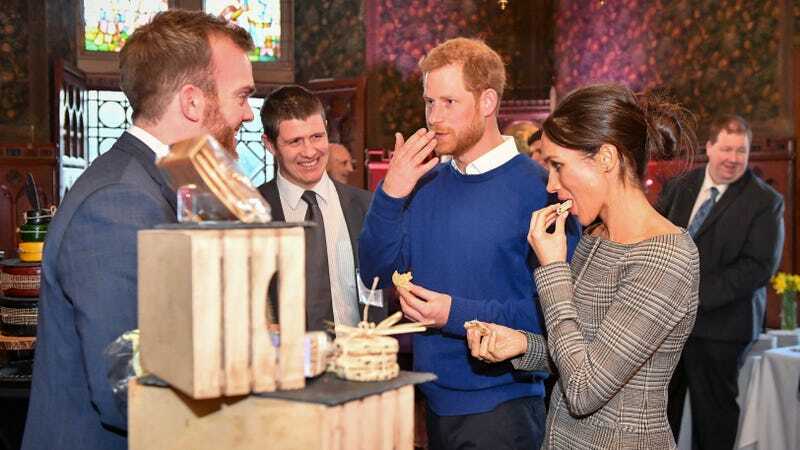 It’s to celebrate their wedding and to offer our congratulations to them,” said company director Simon Mercer, adding that, “We do get asked to make wedding cakes occasionally” and “They are very welcome to take it away but it’s unlikely.” Unclear who actually ended up eating this thing. So: would you chow down on this cake? Personally, my taste buds would be much too flummoxed biting into a piece of cheese that had been cut out of something designed to resemble a cake. Lead me to expect icing and then deliver cheese? No, indeed, my good man. Perhaps, however, you love cheese, and nothing would thrill you more than to discover that what you thought was an unimpressive wedding cake was in fact a tower of fine cheeses. Tastes vary! Later, they got a group hug from a large group of schoolchildren, melting my heart. Maybe I’ll use it as a fondue pot for my wedding cheese.